Panelists at China Daily co-organized roundtable hail the advent of impact investing in the Asia Pacific, calling for greater efforts to realize its benefits and to create a better world for the next generation. For the last five years, the Asia Pacific has been the fastest growing market for impact investments. According to the Global Impact Investing Network, private investors have put in $904 million through 225 direct deals, and development finance institutions have invested around $11.2 billion in Southeast Asia alone since 2007. The total was estimated to have reached $38.6 billion by the end of last year. The impressive amount being channeled into the region is helping impact investing grow in Asia. That has created both opportunities and challenges, both of which were the focus of a roundtable at the 2019 Asian Financial Forum. 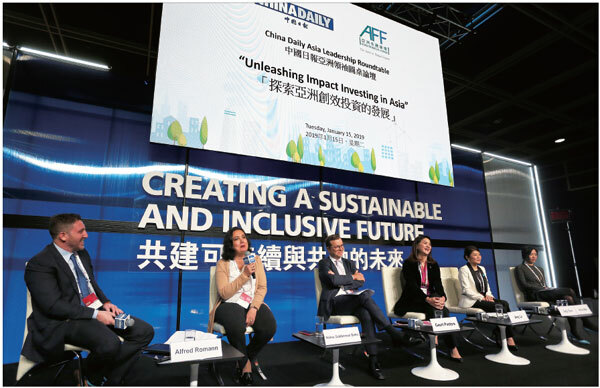 Co-organized by China Daily and the AFF, the goal of the "Unleashing Impact Investing in Asia" roundtable at the Hong Kong Convention and Exhibition Centre was to discuss a topic that, at least in Asia, is often misunderstood. "With the erosion of capital and the slowing down of the economy, we want to look at the brighter side of things," said Zhou Li, editorial board member of China Daily Group and editor-in-chief of China Daily Asia Pacific, in his welcome speech. "We want to throw the spotlight on the best possible tools of impact investments," said Zhou, adding that he was happy to note that women made up the majority of the panel. Moderator Alfred Romann, managing director of Bahati Ltd and a contributing editor for China Daily Asia Pacific, kicked off the discussion with a question. "Asia is home to some of the greatest social needs and pools of capital in the world. The question is, how do we match the two?" he asked. A key obstacle noted by the panelists was a misconception many investors have that sustainable investments do not provide good returns. Amy Lo, chairperson and head of Greater China, UBS Wealth Management, at UBS AG, recounts the time she spoke about that subject with a wealthy family. "When I brought up impact investing in our conversation, they tried to stop me and said they already have funds set aside for charity. I had to explain that impact investing is an investment strategy that considers environmental, social and governance (ESG) criteria that would generate equal, if not better, returns," she said. "Education is needed to make the distinction between charity and investment. Impact investment is the new kid in the region; it is getting good traction but more awareness is still needed." Naina Subberwal Batra, chairperson and chief executive officer of Asian Venture Philanthropy Network, concurs. "We take a very left and right brain approach to investment and sustainable causes. Philanthropy is very close to all of our minds; there isn't anyone in this room who doesn't want to do good. Yet, not enough are applying it to their portfolio," said Batra. "In the long run, the returns on sustainable investments are actually much better. It's important to break that boundary," she added. Lo cited a study a study by UBS on 5,000 global investors, of whom 400 were in Hong Kong. "Two-thirds agreed that impact investing is an important topic. But only 30 percent invested as such. In Hong Kong, 85 percent of them were in agreement. Yet, less than one-third put their money in it," said Lo. "Achieving any impact is a long-term investment because impact takes time. Investing in industries that either do no harm or are improving conditions is just good business sense. So it should provide the same returns," said Batra. Geert Peeters, executive director and chief financial officer at CLP Holdings, said environmental, social and corporate governance reporting would help with awareness. "Communication and transparency is important, that's why ESG matters. Data is the key to engaging others," said Peeters. He also called for other metrics to measure the benefits of impact investments besides returns. Ronie Mak, managing director of sustainable investment company RS Group, said her firm has been looking at socially responsible investing since its founding 10 years ago. "When we were looking for sustainable investments, we couldn't find any here that met our requirements. So we had to look to the EU for that. What that means is a flow of capital out of Hong Kong. We need more products and solutions here or in the region that meet investor needs," said Mak. "What investors need to see are existing funds and actual products with track records. We need product solution suites, not just talk," she added. Mak stated that it was urgent for Hong Kong to embrace that. "Organizations in more mature sustainable investing markets are looking our way. It's important that we do it before they do. We have our own unique culture here so let's build sustainable investing our way." Mak also responded to an audience member's remarks about the need for cohesion between all investors and stakeholders. "We recognize the gaps in the ecosystem. Fragmentation is something we see in a lot of initiatives. Collaborations to do it holistically makes sense," said Mak. She suggested a peer group for likeminded investors so they can learn alongside each other and even co-invest, as it needs to be done "for the world and sustainability". Judy Chen, chairperson of the Hong Kong Committee for the United Nations Children's Fund, urged everyone to think of the next generation. "We are all parents, our children have to grow in this world we leave them. So let's look at how we invest our wealth into it and create a better world for the next generation," said Chen. Karen Ho, an audience member who works in financial products sales at Bloomberg, found the panel discussion "fantastic". "It was spot on about Asian investors having different views and concerns about impact investing. 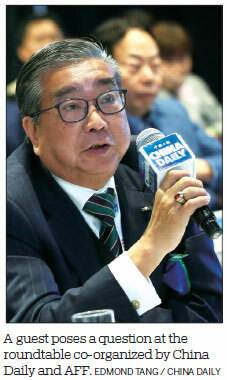 I also agree with the ideas about collaborations because the market is very fragmented," said Ho. "I particularly liked the point about building the sustainable investing ecosystem our own way with consideration to our needs and culture. A lot of existing guidelines are very US and EU-focused," she added. Pindar Wong, chairman of VeriFi (Hong Kong) and chief architect of the Belt and Road Blockchain Consortium, also stressed the importance of impact investing. "If we don't have impact investing, which encourages sustainable industries, we don't have very much left. And, I think China has a great opportunity to lead," Wong said. He believes that through his effective invention - a positive sum cryptocurrency - people can now uses measurements to evaluate the social impact. Wong added that, in the digital world, when talking about ideas, people do not have to play a zero sum game and can actually achieve a win-win situation. There are a lot of problems with negative social impact called "negative externality". For instance, when a man pollutes (the air) with carbon dioxide, the cost is not borne by him - it's borne by society. Now, the negative impacts that other people are putting their costs on society must be reduced.